Lingro is an amazing online tool that turns any website or digital text file into an interactive dictionary where users can click on a word to view it’s definition and hear it’s pronunciation. Support by 12 languages, Lingro is also a very useful tool for translating text. Lingro is easy to use. Just copy and paste any web address into Lingro’s web browser and click on a word, or use the file viewer to upload a document and translate it in the same way. One of the most impressive features of Lingro is that it stores and remembers all the words you click on and allows you to easily create and store words lists. 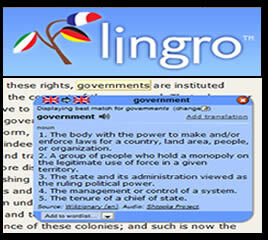 Then, with the click of a button, Lingro turns your word lists into an online flash card game. This tool does not require a login to use the most basic features so it can be a handy tool for students without an email address, but teachers should create a free account to take advantage of additional features, such as storage, history and word lists.